If you have a game room with a pool table, you need a cue rack. Here at PoolDawg, we carry a wide variety of pool cue racks for your cue stick collection ranging from standard two piece rack sets to beautiful oak, mahogany, chocolate, wine and midnight stained wall racks. More interested in floor pool stick holders? 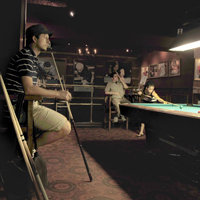 Check out our complete selection of pool cue floor racks too!